We understand the importance of having the highest quality cables and power to get the best possible audio. 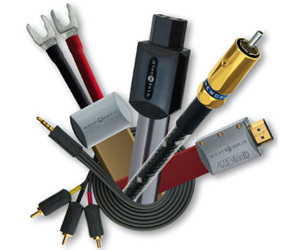 We feel it’s very important to connect your audio and video components with high quality cables. For years, a great debate in audio circles has been: do cables really make a difference in the sound? Every cable acts as an antenna. With all the radio transmissions in the air, you don’t want the cable to become an antenna and introduce noise into your system. If you are running speaker cables a long distance, you also want to make sure you have a large enough gauge to carry the signal effectively. Connections at each end need to be tight and secure. We can demonstrate the difference a good cable can make in our listening rooms, and we even have loaner kits so you can try them out yourself at home! Nothing has shown the impact of cables more than the introduction of HDMI for video. We’ve had clients use an inexpensive HDMI cable brand for a long TV run and see all kinds of signal problems due to inferior construction and design. When the cable was replaced with a high quality HDMI cable, the problems went away and the picture looked better! Another important thing to consider is the power coming into your home. Here, you need to be concerned about two points: protecting your gear from external surge events, and cleaning the power as it fluctuates in both voltage and signal noise. It is extremely important to make sure all of your components are fully protected from external surges. Some direct hits are catastrophic events, and impossible to stop with anything, but in most cases a nearby surge can be blocked by a good surge protection unit. Power conditioning can make a big difference in performance if your power company supplies dirty power. This happens in metro areas or at the end of a run. Electronic Integration has lots of choices for you to take home to try out to see if a power conditioner improves your system’s performance. Remember, all of your components are designed on test benches with great clean power. The power you get from your wall socket is almost certainly not as regulated or clean!